A standard in flow measurement. Westfall Manufacturing has been producing customized Venturi Flow Meters to meet our customers’ specifications since 1958. These easy to install, low maintenance devices provide reliable performance and minimal headloss for a wide range of municipal and industrial applications. 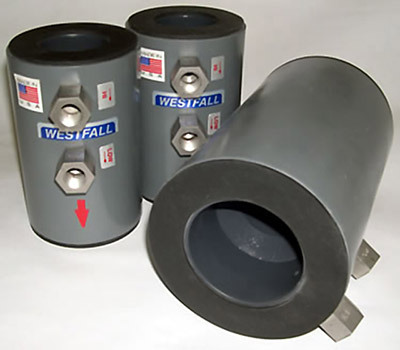 Westfall manufactures two Venturi flow meter models. The Model 2300 is a tried and true design that provides high metering accuracy and low permanent pressure loss. The Model 2350 features the same tried and true features but is designed to fit an ultra-tight profile. Both Westfall Venturi’s offer the same easy installation, minimal maintenance requirements and accuracy. Both offer superior performance for less money. The flow conditioning within the meter’s inlet section allows for close coupling with upstream pipe fittings. If pressure drop is important, the outlet cone can be extended to meet the user’s headloss requirements. A special reverse flow bi-directional Venturi is available for systems where water flows in during one cycle and out during another. The Westfall Venturis are made of Fiberglass Reinforced DERAKANE® Vinyl Ester Epoxy in a wide range of standard and custom sizes. This material is dimensionally stable and will ensure accurate flow measurement for long life. It is highly corrosion resistant, self-scouring, and can accommodate a wide range of line fluids, line pressures and temperature conditions up 3500° F.
The Venturi Meters can be supplied with Bronze, Stainless Steel or other metal throat materials. The carbon steel holding flange is coated with Vinyl Ester Epoxy and has 316 Stainless Steel pressure connections. Both Models 2300 and 2350 come ready to install with neoprene flange gaskets, to fit pipes from 3/4″ to 120″. Westfall’s Venturi Meters excel at measuring gas flows. They are better Venturi’s for less money.